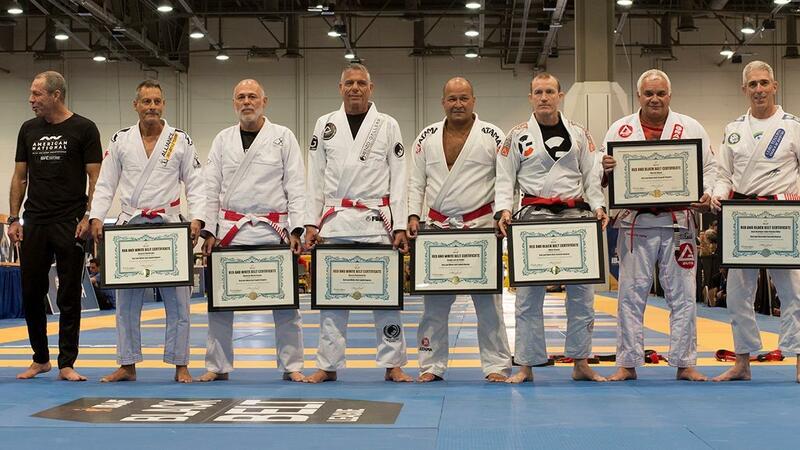 Eight of the art's greatest living masters were honored by the IBJJF with promotions to some of the most senior ranks available. Jiu-jitsu differs from other martial arts in that ranks are awarded purely by time served - once achieving the black belt a practitioner will receive degrees (signified by stripes) on his belt. The color of the belt will change once a black belt receives seventh degree, at which point they become a red and black belt master (also known as a "coral" belt). Eighth degree is a red and white belt. It must be noted it takes 31 years upon receiving the black belt to achieve seventh degree and 38 years to reach eighth degree.